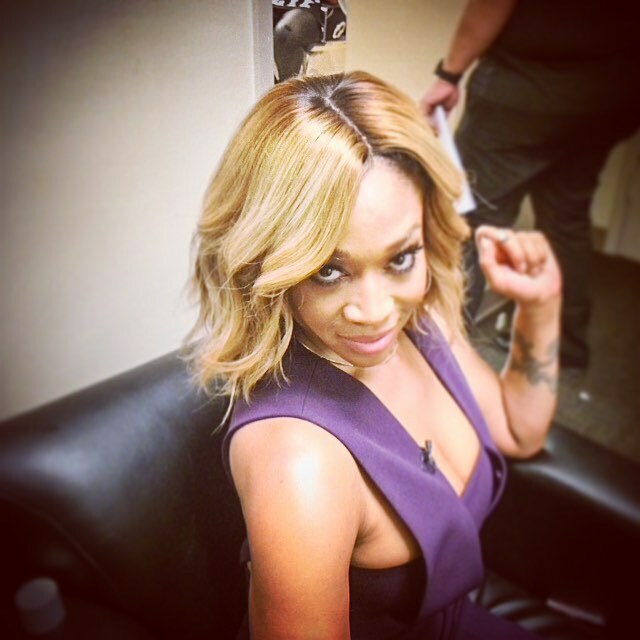 You’re looking for a bob hairstyle, but do you know exactly what you want? Do you want to not follow the trends or are you feeling especially trendy? Whatever inspiration you’re looking for, we have some of that for you. 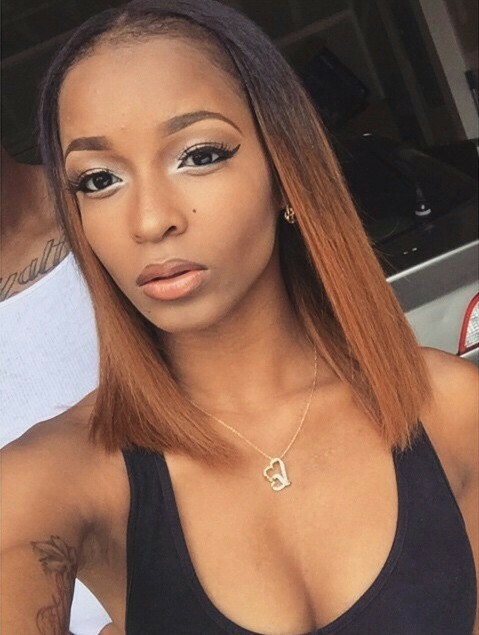 Here are some trendy bob hairstyles for black women. Blonde hair looks absolutely amazing on black women. The contrast looks so good. 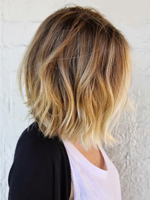 After getting the blonde color, kick it up another notch or two and get an asymmetrical bob. It doesn’t matter what side it’s on, but in this, it’s short on the left and gets long on the right. 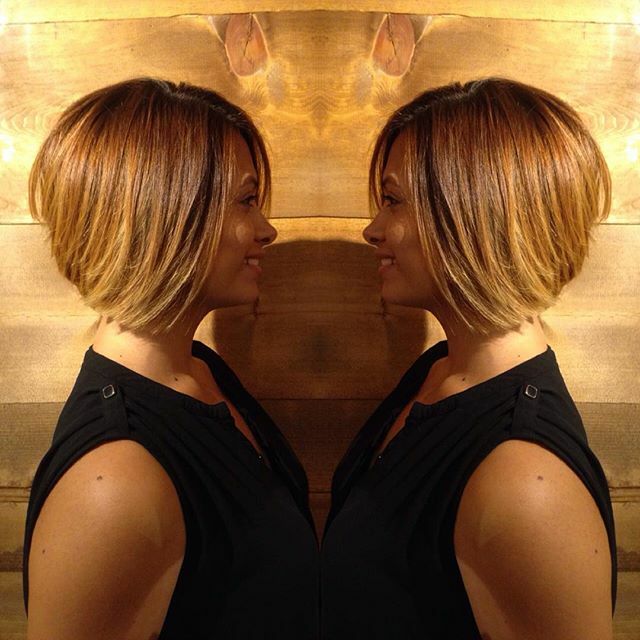 Add some stacking or layers in the back to make it a graduated bob instead of an a-line. For a romantic, flirty look, switch your blunt bangs or straight long bangs and add some waves to them. Keep them in place with a generous amount of hairspray. This is another way of adding color to your hair when you don’t want too much or too little. Have a happy medium by leaving the bright color on the lower half of your hair. Instead of having curls, have little waves that look like they’re flying back with the wind. With a flat iron, move your layers back and make sure they have a little wave to them. Get someone to help you with the back if you need to. Make your bangs side swept, covering an eye for that mysterious flirty look. You have a heart of gold and now it’s time for your hair to match. Platinum blonde is in, but try out a blonde color that looks golden under the lights. Run the flat iron through so there’s minimum frizz and bring the ends in around the face to frame. Finish it off with hairspray for hold and a shining spray for maximum shine. Who needs to fuss with hair in the morning? If wild isn’t in your routine due to school or work, you don’t need to settle for a boring hairstyle. 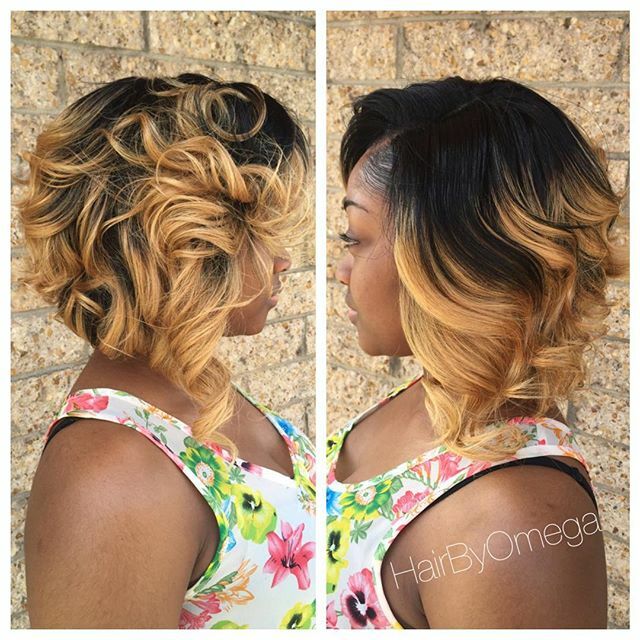 Give your natural hair color a boost by getting an a-line bob. Keep the shine spray on hand to give a few spritz in the morning and during your lunch breaks to bring your hair back to life. This cut is different than the previous ones shown. You don’t need to have a side part when sporting a bob. If the middle part is more up your alley, ditch the side and stick to the middle. Most of the ombres are harsh to it typically being dark brown then blonde, so get something a little different with two shades of brown. Say, a neutral dark brown faded into a warm toned light chocolate brown. 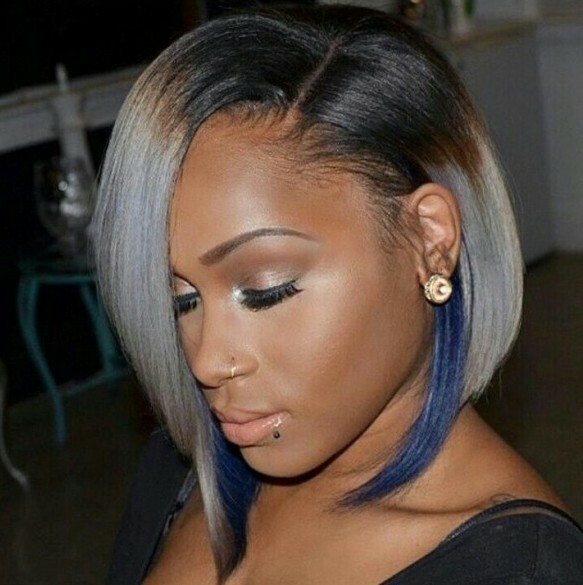 Bright hair colors look amazing on women of color, especially blue. Opt out of your natural hair color and make a bold statement with this color instead. If a bright color all over isn’t for you, you can tone it down by adding peekaboo highlights. 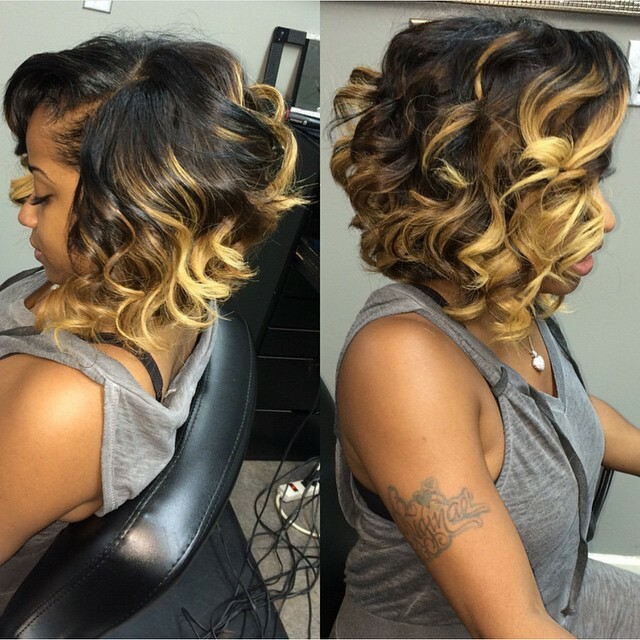 Peekaboo highlights are a great way to add color to your hairstyle without it being too overpowering. 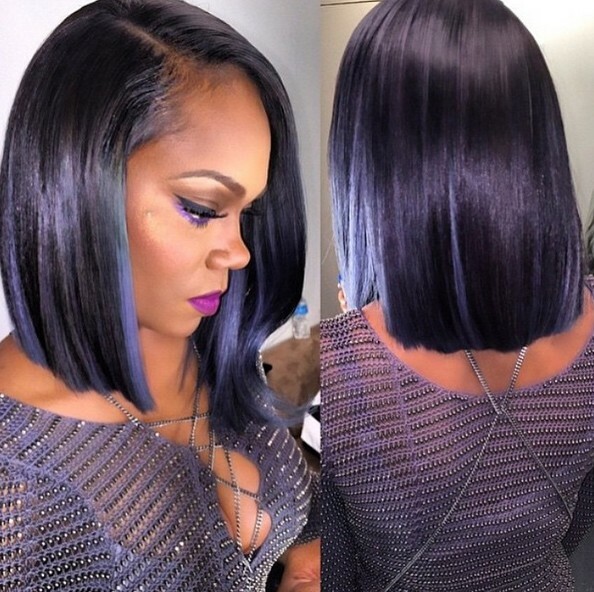 You can use any color in the rainbow, but this pastel purple looks great on dark hair. 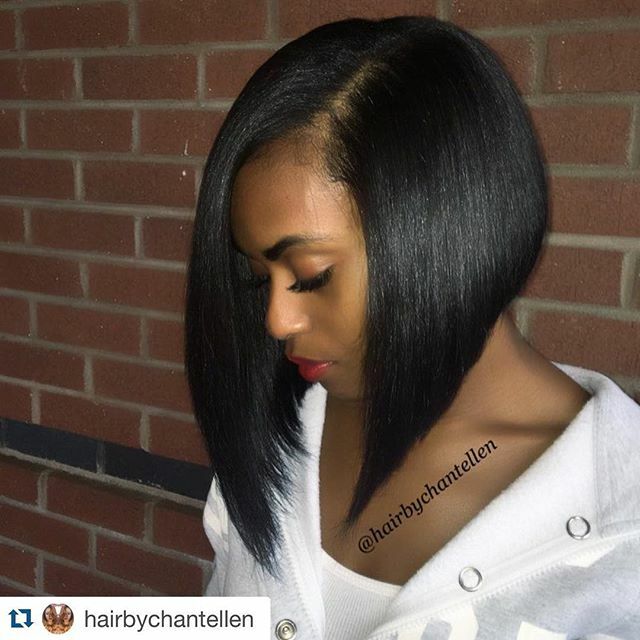 Short bob haircut for black women. It’s easier to have longer hair in the winter to help keep your neck warm, but still try to consider chopping off the long locks you’ve had for so long and try out a graduated bob. For some extra warmth in your new look, dye the hair into an ombre with a medium brown faded into a nice caramel blonde color. 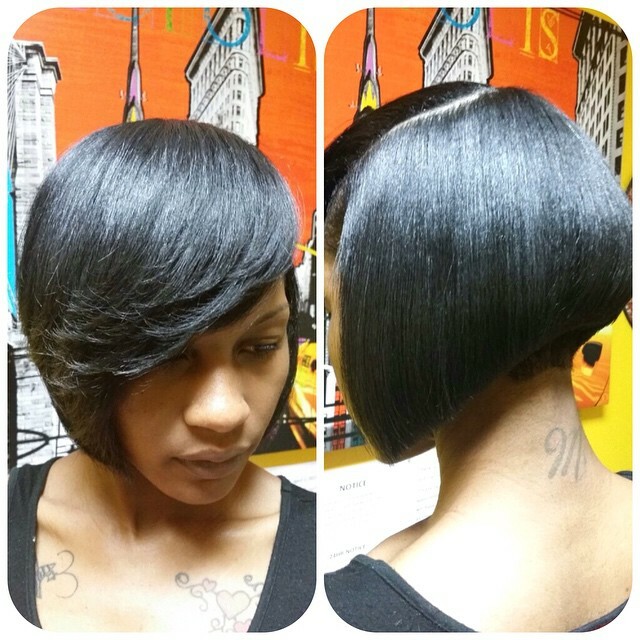 An a-line bob is almost like a graduated bob except that a-line bobs do not have stacking or layers in the back. 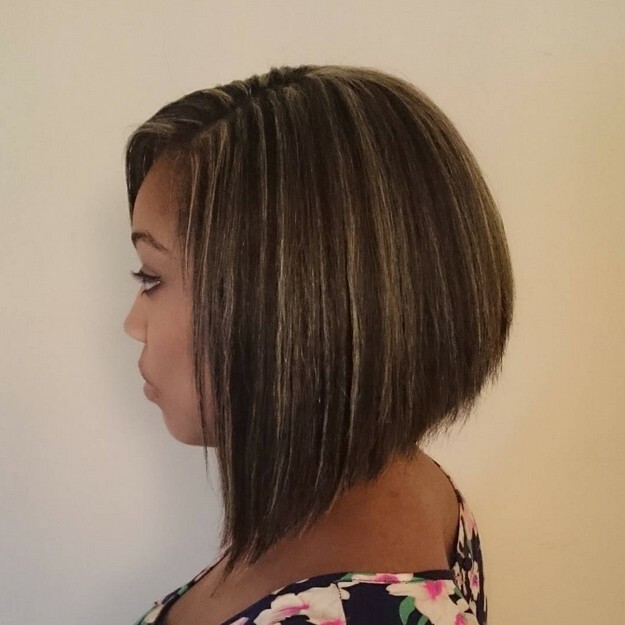 In fact, a true a-line bob is not supposed to have layers at all. If you’re looking for no layers, ask your stylist to go for an a-line cut. To go with it, get some subtle blonde highlights. 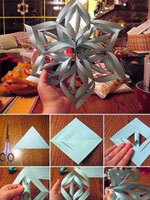 This adds a little fun to your head, but is also 9-5 office job friendly. 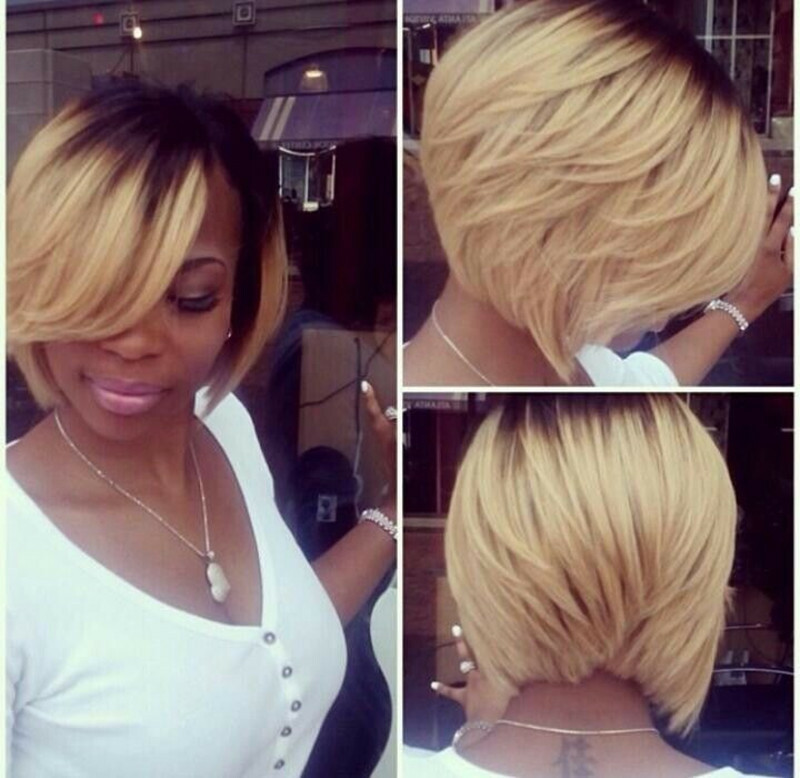 A lot guys love this short cut! If you want to give your boyfriend/husband a gift for his birthday, a long lasting fragrance is a great idea! This is an unique look that looks like it was inspired by neapolitan ice cream. 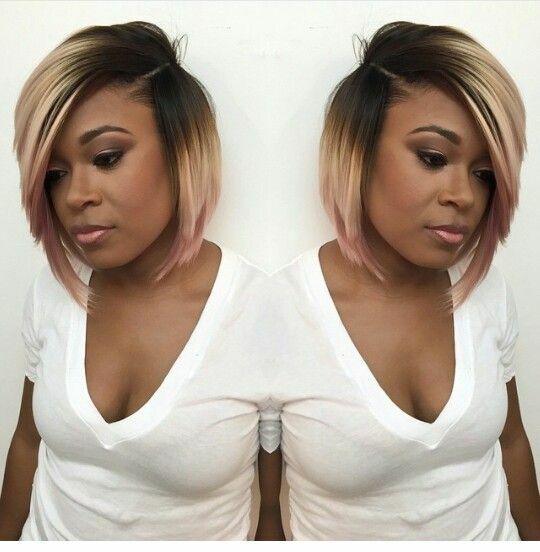 Start off with a dark color, then light, and top it off with light pink on the ends. 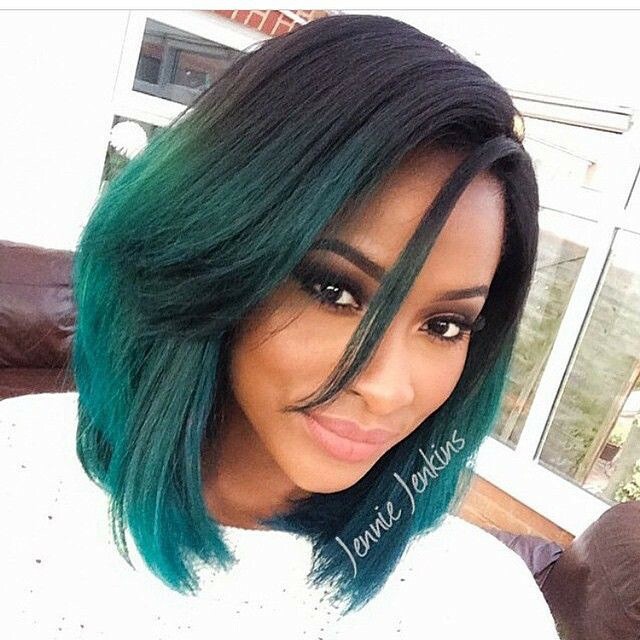 Hair color ideas for black women. Looking for a Storm from X-Men-esque look? 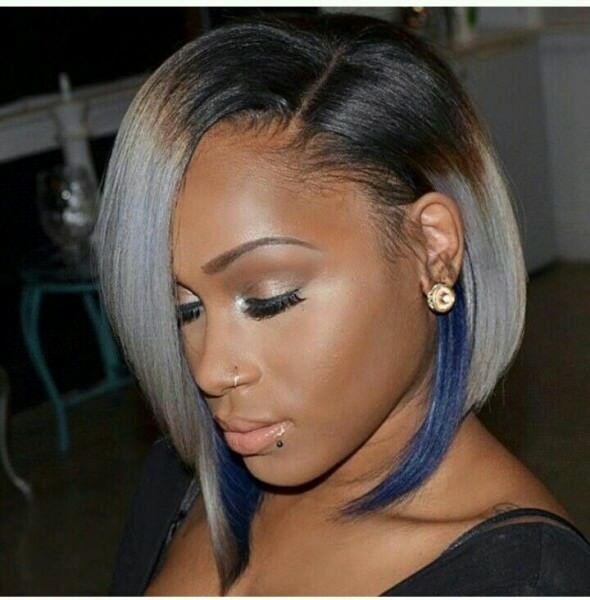 Go with this asymmetrical bob that has black, silver, and blue. Not completely identical to Storm’s character, but it does resemble her and storms a little bit. These three colors put together make an awesome combination. 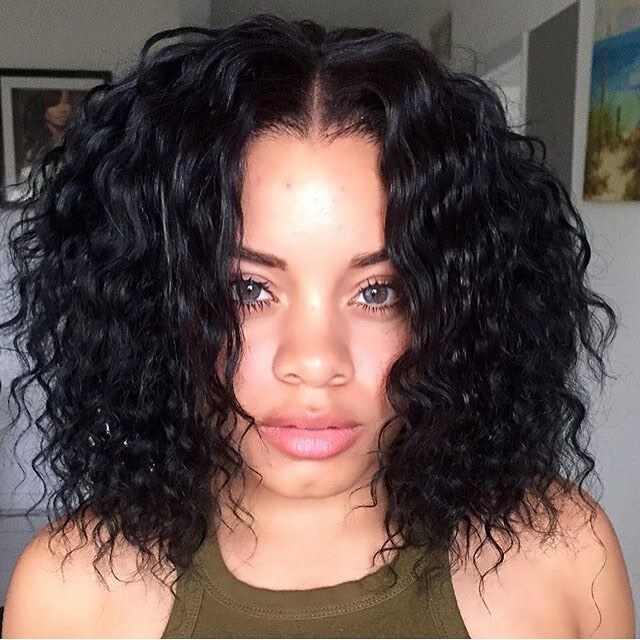 Ditch the flat iron and embrace your natural curls. 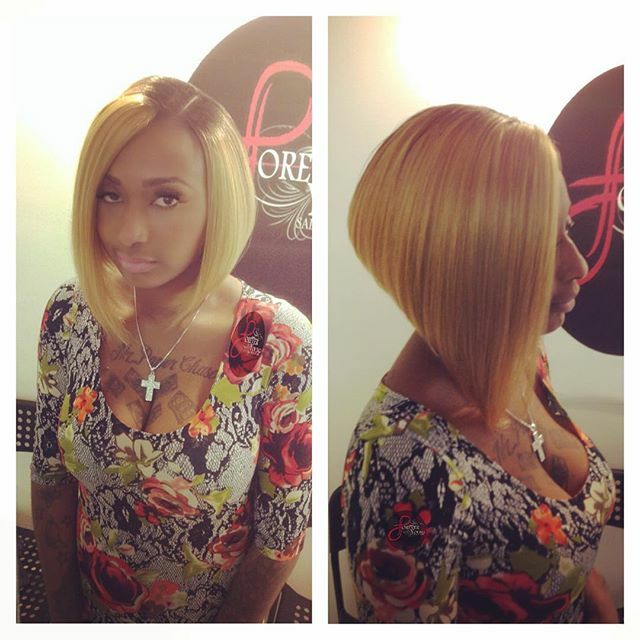 This gives great body and is so much more interesting than the typical, straight bob. Add some curling cream for definition. Instead of blunt straight bangs or bangs completely moved over to the side, give your bangs a little more bounce and flair by making them side swept in front of your forehead. Add hairspray to keep them in place. You don’t need an entire head of curls. With an one inch curling iron, curl your hair in three sections. Instead of curling inward, curl out. Be sure to give your bangs a little curl too so it all blends together. 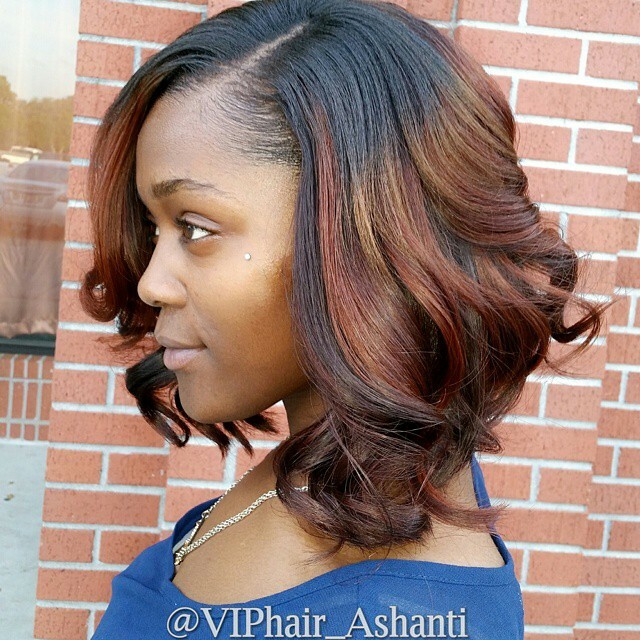 When thinking about what kind of highlights you want to add to your hair, try out an auburn. 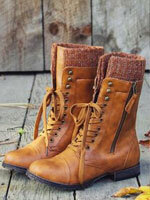 The richness and warmness of the color is suitable for the colder season. This the go-to “I just got out of bed, I swear!” look. Add your stylist to add lots of choppy layers need the bottom to create different lengths in the hair. When you wake up in the morning, add a little texture cream to give all the layers definition. Hold with hairspray and walk out the door. Effortless and stylish. There are a handful of good things going on with this look. The first you will notice is the gorgeous contrast between the natural hair color and the brightness of the blonde highlights. The tight curls galore are another bonus. The holidays are just around the corner and this is a stunning look for those Christmas and New Year’s parties. Having different textures on different sides of a style is a very unique way of styling. 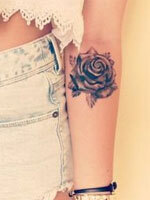 It’s having the best of both worlds and makes heads turn when people take a look all around you. Pick one side for simple waves and the other for tight curls. Need Compacts? Why not try these Top 10 Best Korean Cushion Compacts? 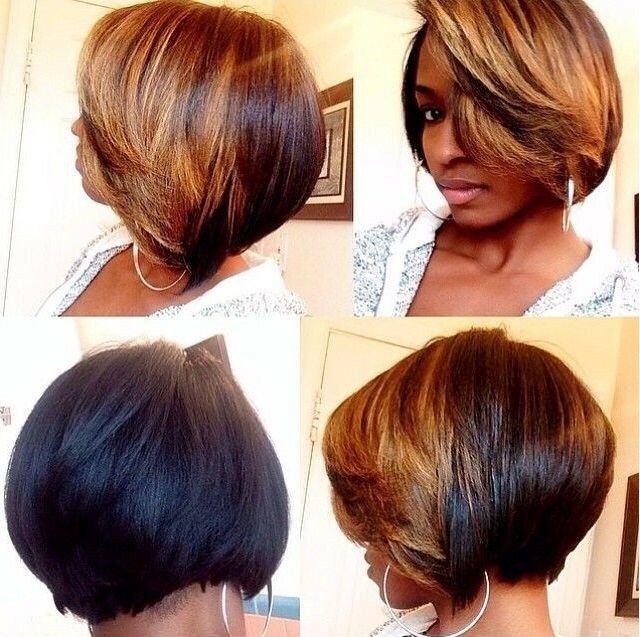 And there are the trendy bob hairstyles for black women for you all to choose from. All styles have very cuts, styles, and colors to be inspired by. Don’t be afraid to take the pictures to your stylist and tweak some to perfectly suit you if you must.